Your gift is what you love to do. It is that activity that makes you lose track of time. True joy comes when you follow your passion and then share it with others. Ideally, we would like it to be our job, but that is not always practical. For some it is solitary, like baking, pursuing arts and crafts, or playing an instrument. For others, it can be spending time with family, volunteering in some capacity, or joining a team playing your favorite sport. 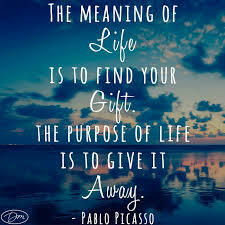 This entry was posted in dont use and tagged divine message for the week, giving, inspiration, inspirational, Inspirational Quotes, life purpose, peace, positive attitude, sharing, spiritual, your gift, your purpose. Bookmark the permalink. Always be true to yourself, no matter what. Thanks for the reminder!